According to an ABC News-Washington Post poll, 44% of registered voters said they want a third-party option. Well, there is one. Since 1972, the Libertarian Party has had a presidential candidate on the election ballot. This year, its candidate, Gary Johnson, is on every state ballot and is polling at 10% of registered voters in a Fox News poll. So, what does a Libertarian candidate stand for? 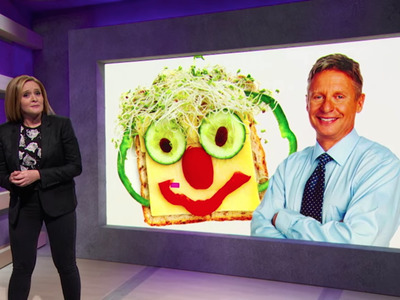 “A libertarian is fiscally conservative and socially liberal,” Johnson, who served two terms as the New Mexico governor in the ’90s as a Republican and also ran for president in 2012, told the “Full Frontal” host. Johnson supports the legalization of marijuana, abortion rights, the free market, and generally keeping “the government out of the bedroom.” He’s also against the bailing out of the auto industry, guaranteed government student loans, American military intervention in other countries, and big government. “Here’s the thing with libertarians: I support every other thing you say,” Bee summed up her thoughts on the party’s positions on the issues.